Four hands, three composers, one glimpse into eternity. If “Harmony for a New World” is any indication of the sounds we should expect when we get there, it is going to be a terrific place to be. There will be two pianos and two percussionists, and the place will sparkle and soothe with seductive sonorities. There will be echoes of Messiaen and Crumb, and the landscape evokes ravines, fireworks, and celestial dancing lights. Quattro Mani is the house band; a piano duo that has taken its harmonious act to Carnegie Hall and whose star is in the ascendant. 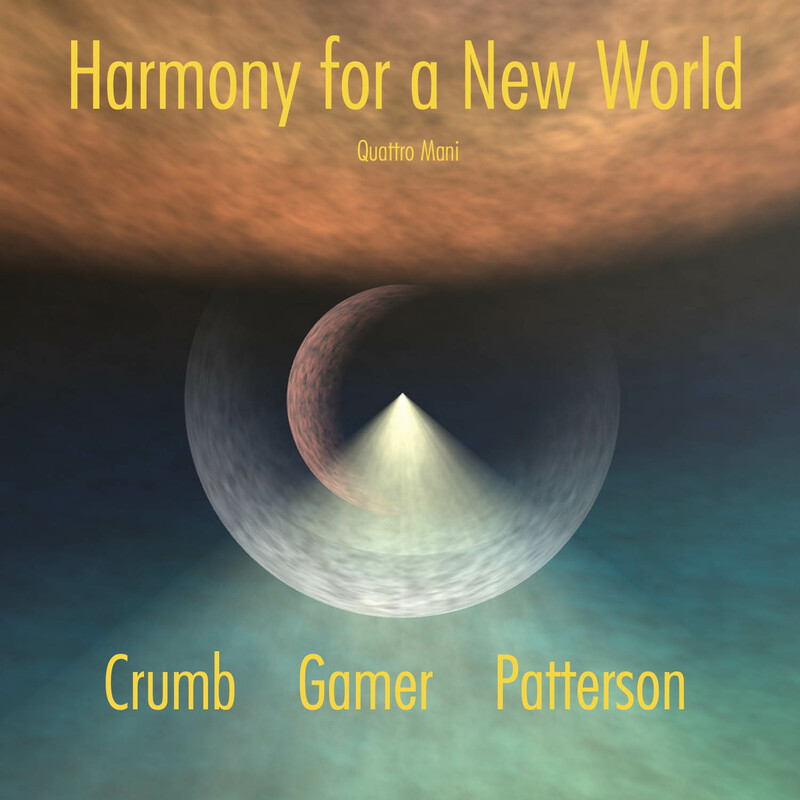 Composers David — son-of-George — Crumb (Oregon), Carlton Gamer (Colorado), and Robert G. Patterson (Tennessee) have crossed state and aesthetic boundaries, amassed international accolades and make for an inspired and complementary grouping. This is a fantastical voyage of tripping lights, and one world you won’t want to leave. This spacious and dramatic work (Crumb's Harmonia Mundi) is scored for two pianos and two percussionists. He takes advantage of the resonant qualities of the pianos, and there are some beautiful doublings with cymbals and metallophones... I bet it would be a fantastic concert experience. ... Fantastic performances by all the players and excellent recording quality.